Companies are more successful with them than without them! Unitus Seed Fund is a venture seed fund supporting startups innovating for the masses in India. Unitus invests in healthcare, education, mobile commerce & value-added services, marketplaces & e-commerce, retail & distribution, agriculture, and water & energy sectors. Founded in 2012, Unitus Seed Fund is part of the Unitus Group, a financial services group operating in India and other emerging markets since 2000. Unitus Seed Fund is based in Bangalore and Seattle. In India, women comprise about 30 percent of corporate senior management positions, which is notably higher than the global average (24 percent). But in the overall workforce, India is one of the worst countries in the world — 113th out of 135 — when it comes to the gender gap. And women entrepreneurs constitute only 10 percent of the total number of entrepreneurs in the country. We believe that women entrepreneurs have an edge over male entrepreneurs. Edges matter to investors. And the numbers back this up outside India. I believe that this is also true in India. One of the most obvious reasons to invest in women leaders in India is that women control the vast majority of household spending. So unless you are a business that is focussed mostly on men, women are more likely to better understand customer perspective. Another is that women are often better at building long-term relationships than men. Lasting relationships benefit a business tremendously, as only so much can be achieved without trust… with employees, customers, suppliers, shareholders, government, etc. There is also the factor of having diversity in a leadership team. Multiple studies, including Kellogg’s Better Decisions Through Diversity, argue that “socially different group members do more than simply introduce new viewpoints or approaches… diverse groups outperformed more homogeneous groups not because of an influx of new ideas, but because diversity triggered more careful information processing that is absent in homogeneous groups”. In a world of information overload, having better information analysis capacity and doing smarter things with the information you have will provide a competitive edge. The overall median proportion of female executives in successful companies is 7.1 percent, compared to 3.1 percent at unsuccessful companies. A company’s odds of success increase with female executives at the VP and director levels. Statistically significant evidence shows that there is dependence between a company having female executives and its success. 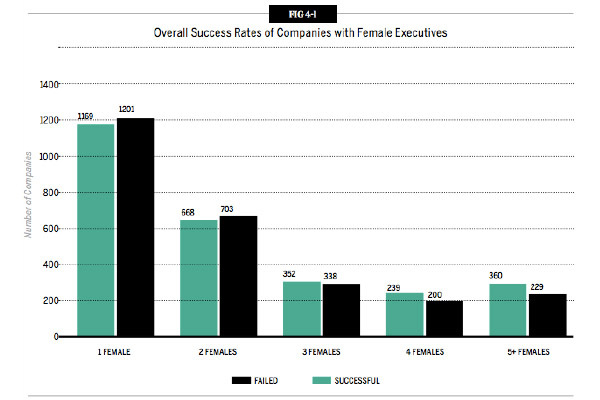 For startups with more female executives, there is a higher success-to-failure rate. As you can see in the chart below, companies with 1-2 female executives have close to a 50/50 failure/success rate, with failures exceeding successes by 5-10 percent. 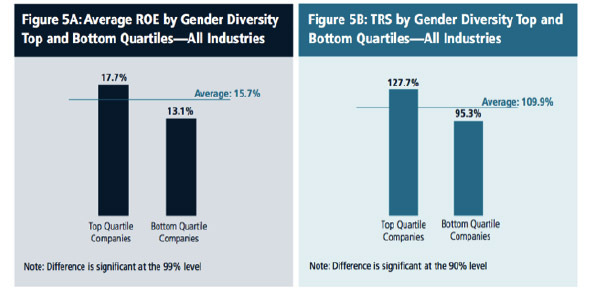 But in the smaller samples of companies with 4-5 female executives, the succeeding companies outnumber failing companies by between 20 and 50 percent. Companies with the highest representation of women on their top management teams experienced better financial performance than companies with the lowest women’s representation. This finding holds for both financial measures analysed: Return on Equity (ROE), which is 35 percent higher, and Total Return to Shareholders (TRS), which is 34 percent higher. The numbers don’t lie – at least in US-headquartered venture funded and public companies. There’s no reason that women will not provide similar or greater benefits to growing organisations in India. The challenge will be where to find them. According to the Economic Times, as of 2012, women students at IITs had almost doubled to 11 percent in five years and their numbers at two B-schools - ISB-Hyderabad (29 percent) and IIM-Kozhikode (36 percent) - were inching closer to Harvard Business School (39 percent). Other IIMs are lagging though. IIM-Calcutta has only seven percent women in the class of 2013 and IIM-Ahmedabad only 10.9 percent. Role models are vital for encouraging more women into technical and business universities as well as to entrepreneurship. Author Rashmi Bansal recently published “Follow Every Rainbow: Inspiring Stories of 25 Women Entrepreneurs whose Gentle Touch Created Strong Businesses.” I’m hopeful that more broadly read stories of successful women will provide encouragement to attract more to the field. We are on the lookout for exceptional women entrepreneurs. And other smart VCs are too.